Any opportunity to work with our Alma Mater, Colorado State University, is taken with relish. This is especially true when the project is dealing with coffee. As part of the 2014 renovation of the Lory Student Center, a new coffee shop was built to serve students. Our creative director worked alongside the LSC Marketing department to bring the venue into reality. True to its name, Intermissions offers a break from class, work, and also theater events. 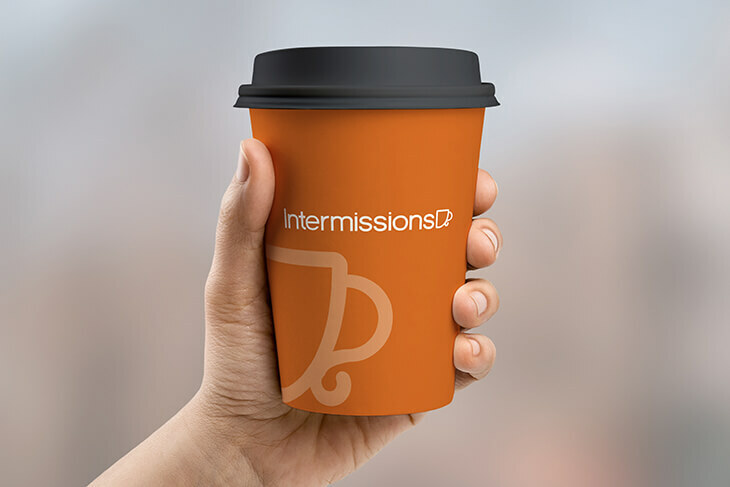 Located right next to the LSC Theater, Intermissions serves up hot coffee to attendees. Letter 13 Creative developed the brand and identity of the venue, starting with the logo and carrying through to the signage and menus. Using a simple, modern sans-serif typeface and minimal mark add just enough playfulness to the design without being overbearing. The warm gray and burnt orange not only exhibit feelings of coffee but also the experience of sitting in a low-lighted theater. The signage and menus were designed with this same quiet, warm intention.